Imagine not having to drive to work. Not because it’s not necessary to get there, or because the subway line is less than a block away. When it’s time to get behind the wheel, the car will take over. That less-than-completely-fanciful vision came home to Santa Clara University last week, during a gathering of the Silicon Valley Young Professionals organization. As autonomous vehicle technology gathers momentum in the public mind, Velodyne’s LiDAR Division took its story on the road – just up the 101 from Morgan Hill – demonstrating how tomorrow’s vehicles will be able to see, and offering a glimpse of a possible new career path in Silicon Valley. Those on hand at Santa Clara’s Lucas Hall heard Velodyne LiDAR’s Wolfgang Juchmann and David Oroshnik demystify the company’s latest real-time sensor technology for driverless cars and associated mobile mapping, comparing the five senses of the human body to the various sensors a self-driving car might have. While Velodyne's real-time, 3D LiDAR sensors are analogous to the car’s two “eyes” and capture the environment in 3D, the sensor has the additional advantage of 360° sight. (That said, it does need to be augmented with a camera to detect the red and green light of a traffic signal.) Velodyne also demonstrated its latest product, the Velodyne LiDAR Puck –- a dramatically smaller, lighter and less expensive sensor that breaks ground at a time when new applications are hitting the market at a brisk pace. But the evening wasn’t just about the technology. Through a spirited Q&A session, Juchmann and Oroshnik addressed the social, legal and business implications of a world in which drivers sit back and, well, don’t drive. Students were especially eager to learn about what it’s like to work at a technology company like Velodyne, which includes brand name customers Nokia Here Maps, Microsoft Bing Maps, Google's self-driving cars, and almost every major automaker. The big questions: when will the first self-driving cars arrive in dealer showrooms? How willingly will consumers accept this new class of vehicle? What about liability and insurance – who will be responsible? In addition to students from Santa Clara University, representatives from Mercedes Benz and Audi/Volkswagen joined in the discussion, sharing the manufacturers’ perspective on this emerging market. Founded in 1983 and based in California’s Silicon Valley, Velodyne Acoustics, Inc. is a diversified technology company known worldwide for its high-performance audio equipment and real-time LiDAR sensors. The company’s LiDAR division evolved after founder and inventor David Hall competed in the 2004-05 DARPA Grand Challenge using stereovision technology. Based on his experience during this challenge, Hall recognized the limitations of stereovision and developed the HDL64 high-resolution LiDAR sensor. More recently, Velodyne has released its compact, lightweight HDL 32E sensor, available for many applications including UAVs, and the new VLP-16 LiDAR Puck, a 16-channel real-time LiDAR sensor that is both substantially smaller and dramatically less expensive than previous generation sensors. 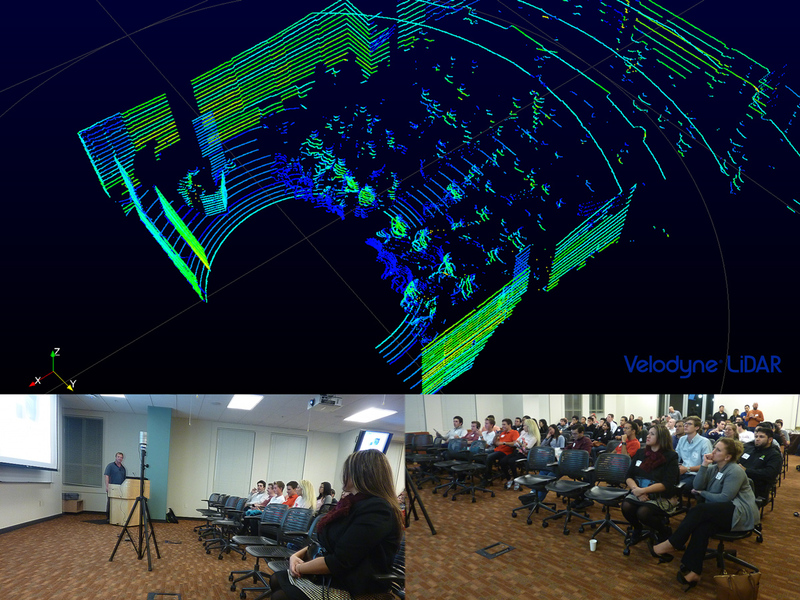 Since 2007, Velodyne’sLiDAR division has emerged as a leading developer, manufacturer and supplier of real-time LiDAR sensor technology used in a variety of commercial applications including autonomous vehicles, vehicle safety systems, 3D mobile mapping, 3D aerial mapping and security. For more information, visit http://www.velodynelidar.com. For the latest information on new products and to receive Velodyne’s newsletter, register here.